Being pretty radical in nearly everything, Joseph was also interested in radical democracy. That (and his love for the environment) is why he founded the Green Party (together with 500 others). His manifesto "Appeal for an Alternative” became a fundamental document for the party. In 1979, he ran for election as a Green Party European Parliament candidate. They failed, but he tried again the next year as the leading candidate for the Greens in North Rhine-Westphalia. Unfortunately, luck was not on his side as his plan failed again. All these setbacks didn't withhold him from supporting the party in the future. Der Unbesieghare is an election poster Joseph designed for the party. It depict a small toy soldier aiming his gun to a big hare. 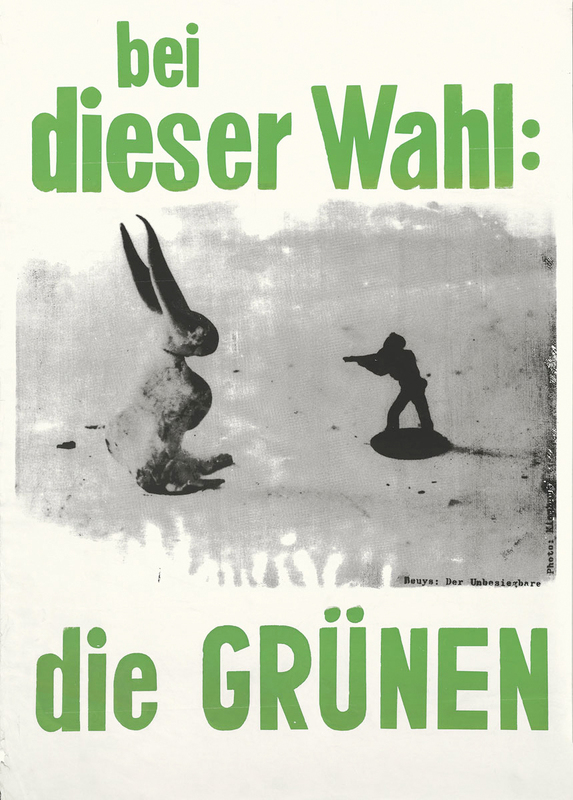 The poster reads “European Elections, The Greens”. The title on the other hand is not a German word. It’s a pun, a rather bad one. Der Unbesiegbare, with a B, means the invincible. So UnbesiegHare basically means “the invincible hare." Joseph was convinced that art was the key to create a better world. In 1985, he wrote the famous words: “Art that can not shape society and therefore also can not penetrate the heart questions of society - and in the end influence the question of capital - is no art.” Ironically, the Broad Museum in Los Angeles acquired 570 of his artworks. Five-hundred-and-seventy-artworks! I guess that's like buying a toothbrush for Mr. Eli Broad who holds the 64th place in the Forbes 400. He was the guy who tipped his friends at BP to invest money in the LACMA. That's why the new LACMA entrance is called “BP Grand Entrance.” I'm pretty sure the thought of his art being associated the oil company BP makes Joseph turn in his grave!